One of my all time favorite crazy games is Typing of the Dead, a game that blends House of the Dead with Mavis Beacon Teaches Typing. Yes, it's crazy - and it's crazy addictive for geeks like myself. Developer Epicenter Games looks to release a spiritual sequel to the genre, with a game that combines Guitar Hero style gameplay with House of the Dead style action. Enter Rock of the Dead. IGN recently got some hands on with the game, describing it as zany game that takes traditional Guitar Heroes out of their comfort zone thanks to horizontal fret patterns, and probably the chance of having your brain eaten. After 10 minutes the previewer managed to hold their own and take on the baddies in this campy shooter. 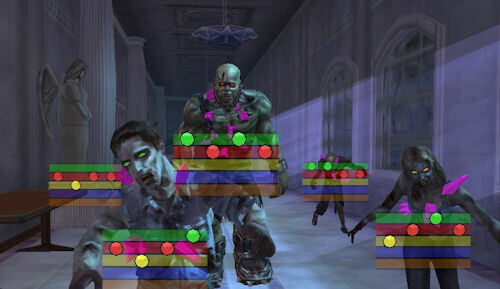 More difficult enemies have longer or more difficult fret patterns to complete, and enemies are able to throw objects at you which also have fret patterns to cause a deflection. If you thought a Metallica song was rough on your wrists on expert guitar wait till you fight the Giant Ninja Zombie with throwing stars. The game does have a strong focus on music, even though there are no licensed tracks, and it doesn't take itself too seriously. Epicenter even managed to get Neil Patrick Harris to do some voice work for the game. Of course a game like this is best enjoyed with a friend, and Rock of the Dead will feature two player drop-in and drop-out co-op play. It'll be interesting to see how communication works in deciding who is taking down what zombie on screen with their face melting plastic guitar shredding. Rock of the Dead should hit the Wii in early summer. Page created in 1.4164 seconds.